Amber Stott, founding executive director of the Food Literacy Center. Photo: Kevin Fiscus. She’s 38, a Savanna, Ill., native, a University of Illinois at Urbana, Champaign, graduate, lives in River Park, blogs at Awake at the Whisk, serves on the steering committee for America’s Farm-to-Fork Capital, advises Michael Tuohy on local food sourcing for the Golden 1 Center and serves as the chief food genius at the Food Literacy Center. 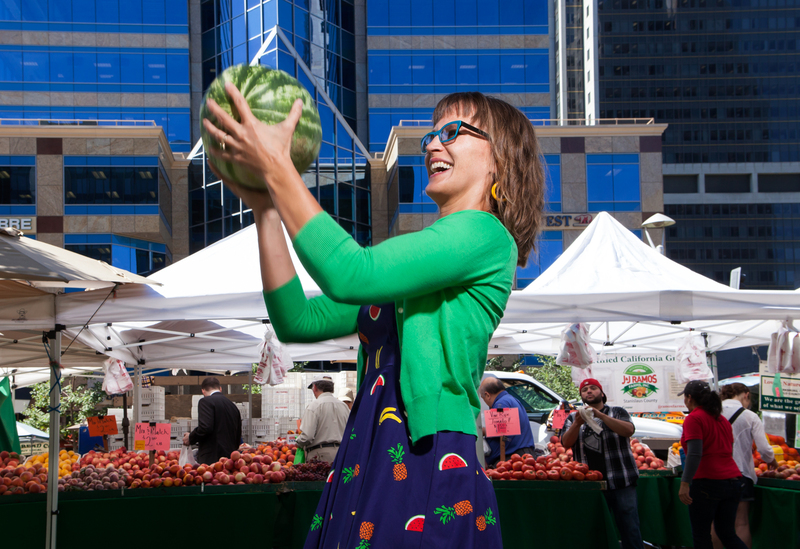 She founded the nonprofit in 2011 with a mission to inspire kids to eat vegetables. The Food Literacy Center teaches low-income elementary school children cooking and nutrition through after-school programs. The pilot program launched at Capitol Heights Academy, a charter school in Oak Park serving kids in kindergarten through the fifth grade, with a curriculum titled “Your Peanut Butter Sandwich Can Save the World.” One of the lessons shows students how to make a healthier PB&J by teaching them how to make a sunflower nut butter and substituting jelly for fresh fruit slices. “You can’t just put food in front of a kid, you have to teach them,” she says. The organization serves 5,000 kids a year on a $250,000 yearly budget with a staff of four. Each year, the nonprofit trains up to 20 volunteers in its Food Literacy Academy to become “certified food geniuses.” These food ambassadors — 62 have made it through the program so far — are critical to teaching the many classes. “We are small but mighty,” she says. In addition to after-school programs at seven area schools, the Food Literacy Center holds 20-minute guided tours for kids every third Saturday at the Midtown Farmers Market, provides free cooking classes with Oak Park Sol and collaborates with the Sacramento Public Library on One Book Sacramento. We met in August at Pangaea Bier Cafe to talk about media consumption, the city of Sacramento and her thoughts on the news. Feeling empowered and energized, she launched her online lifestyle guide to living la vida locavore in 2008. “Awake at the Whisk reflects my attempt to be a conscious eater, baker, cook, and consumer,” she wrote in her introductory post. More importantly, she identifies Sacramento as a city of collaborators. Sacramentans, she says, make connections. People will open the Rolodex to help each other. As someone who has worked in the nonprofit field for 14 years, she is one of them. Amber was a selected as one of the Sacramento Business Journal’s 40 Under 40 in 2012, named a “Food Revolution Hero” by the Jamie Oliver Food Foundation in 2013, awarded the Legacy Feast 2014 Award in the Environmental Category from Valley Vision in 2014, and in 2015, has been named one of Food Tank’s 20 Innovators Protecting the Planet, the Social Entrepreneur of the Year by New Leader’s Council Sacramento and a TEDxSacramento Changemaker Fellow. “And if you do all of these tips, you too can build up a broccoli habit and learn to eat like a kindergartener,” she says. Amber answered the following questions by email about how she gets the news. Text submitted August 2. Social media, email newsletters and a subscription to the local paper. Today's paper! Look at my kiddos dancing and learning! Space shuttle Challenger. I was in kindergarten. I’m certain they softened the news for us little kids, because what I remember most about it was that a woman teacher was getting the chance to go to space. My hometown had great pride in a local guy who was also an astronaut. He wasn’t on that flight, but they turned the focus on us kids–if someone from our town could grow up to be an astronaut, if a teacher could be given the chance to go into space, maybe we could be astronauts, too! The Sacramento Bee delivered to my door. I just ate two candy striped figs as a snack from a local grocer. Yesterday it was a French prune plum from a local farm. Tonight it will be a green zebra heirloom tomato from my garden. We live in a decadent paradise, where every bite that’s locally grown is likely to not just be great, but beyond compare. I walk around in a constant state of childlike bliss by what grows here and what I am fortunate to eat. Thanks for the delicious gift, Jim Mills! Mouth watering local goodness! Civil Eats. National Geographic’s latest food series. Food Tank. NPR. Grist. Mark Bittman. The food system is vast–and I’m often looking for news to stay current in that arena. It takes a lot of time and careful dedication to grasp the layers and nuance of this kind of news, which covers everything from school food to food waste to food access and workers’ rights. It requires news sources with big enough budgets that allow in-depth reporting and aren’t just cranking out quick stories. I’m excited about Lesley McClurg at Capital Public Radio — the new food & sustainability reporter. Rick Kushman is also rocking the radish as a food reporter. The future of a successful food movement depends on well-budgeted food news sources. Those reporters will be our allies in digging deep on meaningful stories that paint the true story of what’s happening on the ground. I make sure to donate to nonprofit news sources like Civil Eats and NPR because that’s what keeps them going and keeps them independent. In full disclosure, I also write freelance for Edible Sacramento and Comstock’s magazines. I have fantastic editors at both publications who allow me the freedom as a writer to cover deeper food system stories. I’m grateful for that! Shout out to Allison Joy and Andrea Hagan Thompson — great editors and writers from whom I learn and grow! (1) Drought — Salmon are important. The environment is important. Farms are important. We all need to work together and the media needs to examine all sides of the story. At the national level I’m seeing very thoughtful pieces on this issue, yet all the experts live and work right here in Sac. (2) Food literacy — Until all children are being taught about our food system we will continue to have generations that are confused. I don’t envy journalists. You practically need a master’s degree in food systems to understand all the nuance in this field. Yet, that shouldn’t be the case. It shouldn’t have to be this hard to understand our food system and to know which resources are giving you accurate information. That’s why we need to educate our kids on the subject just like we do reading and math. Sacramento is at the heart of the food movement. What we accomplish here will have ripple effects around the nation. (3) Literacy — We cannot be a great city if our children cannot read. We have a 40 percent childhood illiteracy rate in Sacramento. An educated society is powerful, creative, strategic, and innovative. Let’s ensure that the future of Sacramento is as dynamic as ever! The 24-hour news cycle kills great journalism, creating quantity over quality. As someone working in education and trying to dispel myths, it’s difficult to compete with the misinformation. Folks get a lot of mixed messages, get confused, and decide not to listen to any of it. From a public health perspective, it’s a nightmare. We’ve got some great writers and some meaningful efforts locally, yet why doesn’t a culinary city like Sacramento have a Mark Bittman of its own?–someone whose opinion on how to shape our food system is nationally sought after. Sac has recipe bloggers who are nationally renowned experts like Elise Bauer at Simply Recipes and James Beard Award winners like Elaine Corn. We need to be leading on broad food system policy issues, too. We need a media outlet that’s willing to invest in the development of the highest level of expertise on this issue by a writer that lives and breathes the food system. There’s so much to learn from within Sac’s food movement that would truly resonate around the nation. I would go in whichever direction the weather is most beautiful at the moment and find a great farmers market and a hike. Waterfall we hiked along last weekend (in slow motion to show how fast it was moving). Wish I was there now! Follow Amber (@AwakeAtTheWhisk) on Twitter and connect with her on LinkedIn.